I have to admit, I don't really like camping. I am sorry, I know, I know but it is not really my jam. I can go glamping, but camping without running water, electricity or bathrooms isn't really how I like to spend my time off. We did go fake camping last summer and it was amazing but there were fire pits, bathrooms and I brought a well stocked cooler that included watermelon margaritas and artisanal hot dogs. Is that even considered camping? But you know what i do love about camping - s'mores. Ooey goey s'mores. Nothing beats those suckers. But since I am not going to find myself camping anytime soon or in front of a fire pit, I decided I need to be able to get that taste and those flavors all year-long. What is the perfect vehicle for these? Cupcakes. So the next time you want all those delicious camping flavors but can't bring yourself to go camping make these s'mores cupcakes and it will be just like the real thing. I know it is kind of lame that I don't love to camp, especially since we have so many amazing places to camp in Northern California. We even have a tent and everything. Maybe I am just getting old but the idea of sleeping on the ground and peeing in the bushes doesn't really appeal to me. But I do love all the fun food that you get to eat when you camp. Some people make s'mores on their stove top. That really doesn't do it for me. Something about using gas to melt the marshmallow weirds me out. 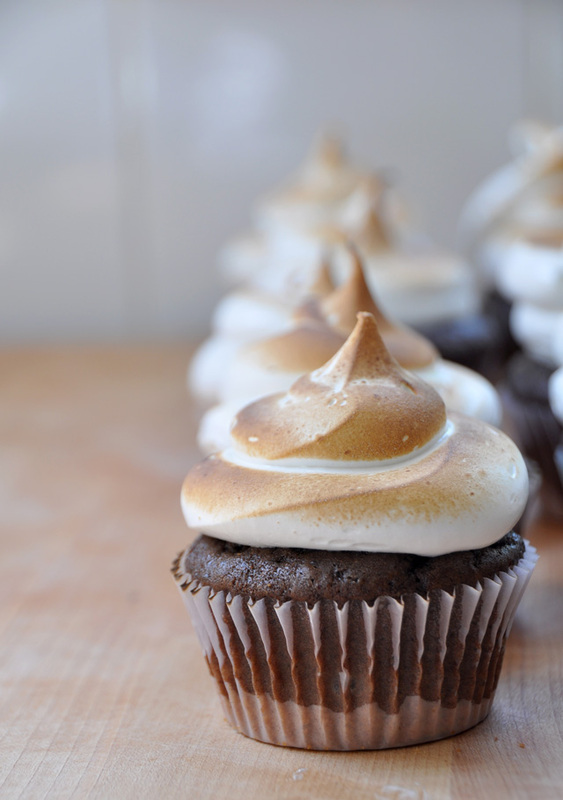 But to each their own.These s'mores cupcakes are the perfect combination of graham cracker crust on the bottom, topped with a perfectly moist chocolate cupcake topped with a silky marshmallow meringue frosting. Plus you get to use a blow torch! My favorite kitchen tool. Nothing beats the original s'more but these certainly come close. Preheat the oven to 350 degrees F. Line cupcake pans with paper liners. In a food processor, pulse graham crackers until finely ground up. Add melted butter and pulse to combine. Place about 1 tablespoon graham cracker mixture in the bottom of the cupcake liners and press to evenly coat the bottom. Bake in oven for about 4 - 5 minutes until golden brown. Let cool while you make the cupcake batter. In the bowl of an electric mixer fitted with a paddle attachment, cream the butter and 2 sugars on high speed until light and fluffy, approximately 5 minutes. Lower the speed to medium, add the eggs 1 at a time, then add the vanilla and mix well. In a separate bowl, whisk together the buttermilk, sour cream, and esspresso.